Below is an A-Z list of common blogging terms. Online representation of yourself, part of your digital identity, appears when you leave comments. Below is an example of a user avatar next to a comment which looks much nicer than using the default avatar. Learn how to create and upload your own avatar here! The term blog originated from the abbreviation of web log or weblog. For classes, this could be a newsletter for parents to see what is happening in your classroom or a place for students to publish work to a worldwide audience or an area for you and your students to reflect on your learning. There are many ways to use your blog in class. We explain how to set up your own blog here! The term blogroll, sometimes written as blog roll or blog-roll, originally referred to the blogger’s list of links to other blogs they read. In the early days of blogging the blogroll was used to link to blogs that the person really liked or recommended to their readers. Nowadays blogrolls are also used to link to websites or resources the blogger visits or wants to share with readers. Blogrolls on class blogs make it easy for students to navigate to your favourite websites. Blogrolls are added using the links widget. When leaving comments you often have to leave an anti spam word or captcha. These could be images containing letters and numbers. You have to type them in to prove you are a human and not a bot. Your categories might be the main topics you will be writing about such as subject areas like Maths or English, or could be student names on a class blog so all their work can be found quickly. Clustrmaps is a type of visitors tracking widget you can add to your sidebar. This is a visual representation of your visitors. Only about 1 in 50 visitors will leave a comment so a map gives you a better idea of where your visitors are coming from. Learn how to add a visitor tracking widget to your sidebar here! 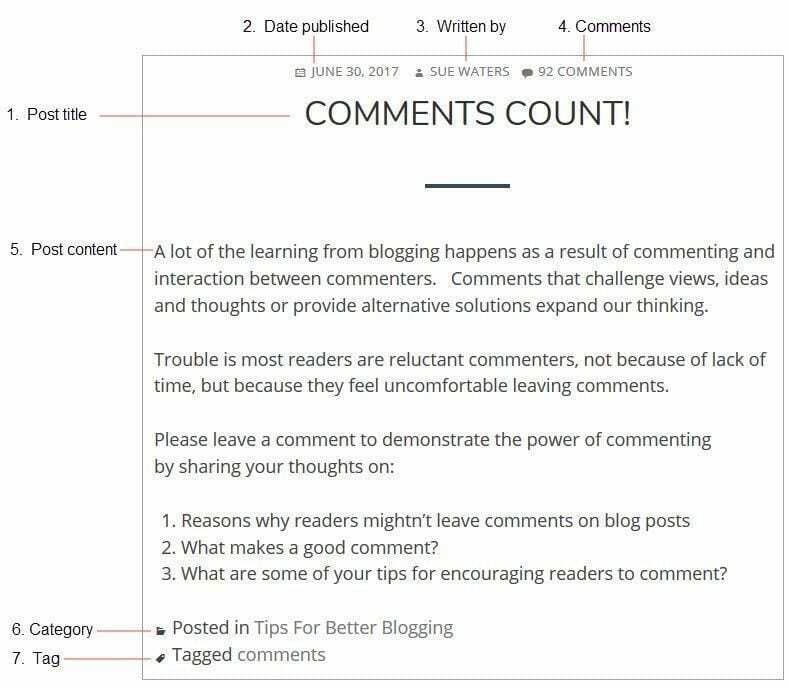 Comments are the area where the conversation takes place in your blog. If you have a question as the last part of your post, it allows great conversations to happen in the comments. 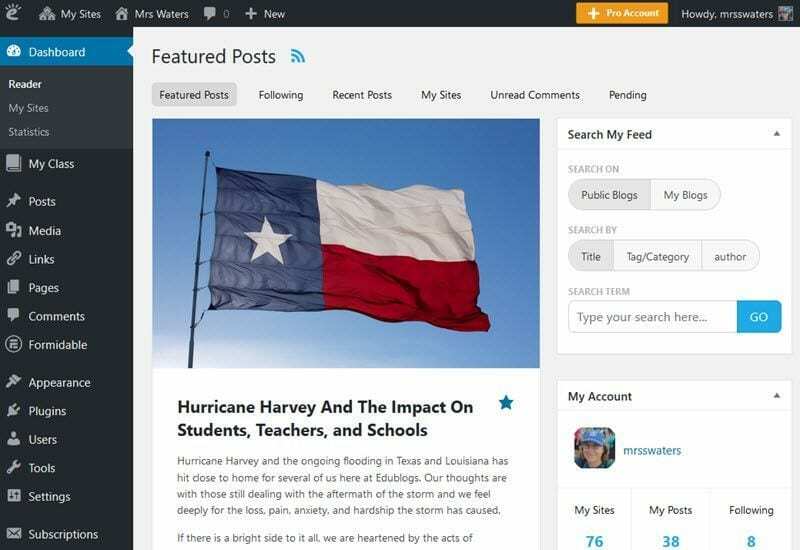 This is the back end of your blog and where you write posts or pages, approve comments or posts if written by students, change password and settings, upload avatars and add new students etc. The header is normally located at the top of your blog and may include your blog title, tagline, navigation menu and is used to set the tone of your blog. Some themes allow you to upload your own custom header which you can use to customize the look of your blog. We show you how to upload your own custom header here! HTML code, also known as embed code, is special code that allows you to embed widgets, audio, YouTube videos, Vokis etc into either posts, pages or your blog sidebar. Here is how to embed content into your posts using embed code. A link is a word, a group of words or an image that you click on to visit a new page or website. Linking to articles, websites or another person’s post when you write about them is an important part of writing online. How to add links to a post or page. How to add links widget to your sidebar. Pages are similar to a post, but pages are static, contain information that rarely changes such as commenting guidelines, about pages, how to contact the teacher or school etc. Links to pages are often found in the header area otherwise you need to include the Pages widget in your sidebar. Learn how to add an About me page here. When you write a post that relates to something you have read in someone else’s post, you have to include a link in your post. This will cause a pingback on their blog and they will know that someone has read their post and thought so much of it, they have included a reference to it in their post. Pingbacks look like comments but usually have [ ….] around the link. This is the main column on your blog. Posts are in reverse chronological order with the newest posts at the top and older posts disappearing off the screen eventually. When you write a post, remember to include a title, categories and tags before hitting the publish button. Posts can be written earlier then you schedule a certain date and time for it to be published. A sidebar is an area in your theme where you can add widgets. Each theme has different numbers of sidebars but generally you can have one or two. When you change themes, make sure you check the widgets again in your sidebars especially if changing from to sidebars to one sidebar. Add the widgets again from the inactive list as your settings will still be remembered there. Learn how to add widgets to your sidebar here! If your post category is science, then tags could include microscope, minibeasts, chemistry, magnets etc. Your theme controls the look of your blog. There are 100’s of themes to choose from. Some have links to pages in the header, some allow you to customize the header with your own images and some are very customizable. When you change themes, make sure you check the widgets again in your sidebars especially if changing from to sidebars to one sidebar. Add the widgets again from the inactive list as your settings will still be remembered there. Learn how to change your theme here! These are the extras you can add to your sidebar. Most common widgets are recent comments, recent posts, categories, blogroll or links, archives and subscribe then you add others such as clustrmap, vokis, bookshelf, class pet, twitter feed etc These are added by using the embed code given to you when you create the widget. Learn how to add widgets here! Join us for a new challenge in Oct, 2019!